Figurative language is to a writer what a paintbrush is to an artist. That is, you can use it to take something simple or flat and transform it into something multi-dimensional. Figurative language has the ability to be more impactful than literal writing; it can expand readers' interpretations and broaden their imaginings. 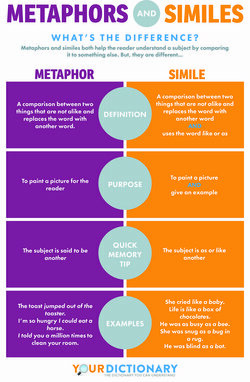 Take similes and metaphors - two of the most popular forms of figurative language. Similes make comparisons using the words "like" or "as." For example, "He was fierce as a lion." Metaphors make more indirect comparisons. For example, "After meditating, he was Buddha himself." You can see how these examples of figurative language give literal meanings a bit of a boost. Instead of using a simile, we could have just said, "He was fierce." Isn't that boring, though? Now, we have an image of a man dominating the room like a lion on the savannah. The same for our zen man. We could've said, "He was very calm." Instead, we're able to conjure up an image of the serene and wise Buddha. Fun, right? Let's get out our paintbrushes and take a closer look. While figurative language is common in literature and poetry as it uses exaggerations or alterations to make a particular linguistic point, it's also used in other forms of writing. Let's explore different variations to see what you'd like to use in your next writing piece. Alliteration: Alliteration helps writers punch points home by repeating the same sound (usually a consonant) of the first or second letter in a series of words. It tends to catch the reader's eye. "The professor praised his pupil's flowery prose." Hyperbole: When a writer exaggerates something - typically in a humorous way - it's known as hyperbole. "My eyes widened at the sight of the mile-high sundaes that were brought to our table." Metaphor: A metaphor is a comparison between two things. They don't necessarily have to be alike but make a link in the reader's mind. "Nobody invites Edward to parties because he is a wet blanket." Personification: When something non-human is given human-like qualities, this is known as personification. "The leaves danced in the wind on the cold October afternoon." 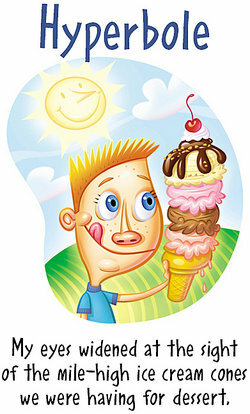 Simile: A simile is a direct comparison between two things, using like or as. "Jamie runs as fast as the wind." Symbolism: Symbolism occurs when something that has one meaning is used to represent something entirely different. For example, using an image of the American flag to represent patriotism. Assonance: Assonance occurs when you repeat a vowel sound in a phrase. "True, I do like Sue." Cliché: A cliché is a phrase that is repeated so often, it's nearly meaningless. "Try walking a mile in my shoes." Idiom: An idiom is an expression used by a group of people with a meaning that can only be understood though common usage. Metonymy: Metonymy is a figure of speech where one word is replaced with a word that's closely associated with it. For example, you might hear Washington used to refer to the U.S. government. Onomatopoeia: When the name of an action imitates the sound it makes, it's known as an onomatopoeia. "The bees buzz angrily when their hive is disturbed." Synecdoche: A synecdoche is a figure of speech using a word or words to represent a whole. For example, if you refer to credit cards as "plastic," you're using a synecdoche. For some, figurative language can be challenging to understand. In some ways, we're dealing with the abstract, so it's important to approach the subject from a few different angles. These additional resources can help you approach figurative language with confidence. YourDictionary's Metaphor Examples for Kids and Simile Examples for Kids provide lots of simple examples of these types of figurative language to give children a good grounding in the topic. Education.com offers lesson plans and worksheets to help language learners practice their newfound form of expression. KidsKonnect creates interesting worksheets for kids to use either at home or at school. TLS Books has devised a printable worksheet that challenges students to rewrite sentences, eliminating figurative language and defining the literal meaning. Read. Write. Think. provides a lesson plan for students in grades 6-8. It uses The Phantom Tollbooth to introduce the concept of figurative language. PULSE helps high school students understand figurative language using The Wreck of the Edmund Fitzgerald by Gordon Lightfoot. Figurative language provides endless depth to our writing. There are so many ways to really punch our points and invite readers to join us on a literary adventure. When used carefully, figurative language even has a place in professional spheres. It can draw interesting comparisons between two things, promoting consideration for your cause. So, go ahead and dust off your metaphorical paintbrush as you explore a little synecdoche or personification in your next writing piece. Who knows where it will take you! "Figurative Language." YourDictionary, n.d. Web. 24 April 2019. <https://grammar.yourdictionary.com/style-and-usage/Figurative-Language.html>. Figurative language is to a writer what a paintbrush is to an artist. That is, you can use it to take something simple or flat and transform it into something multi-dimensional. Figurative language has the ability to be more impactful than literal writing; it can expand readers’ interpretations and broaden their imaginings.